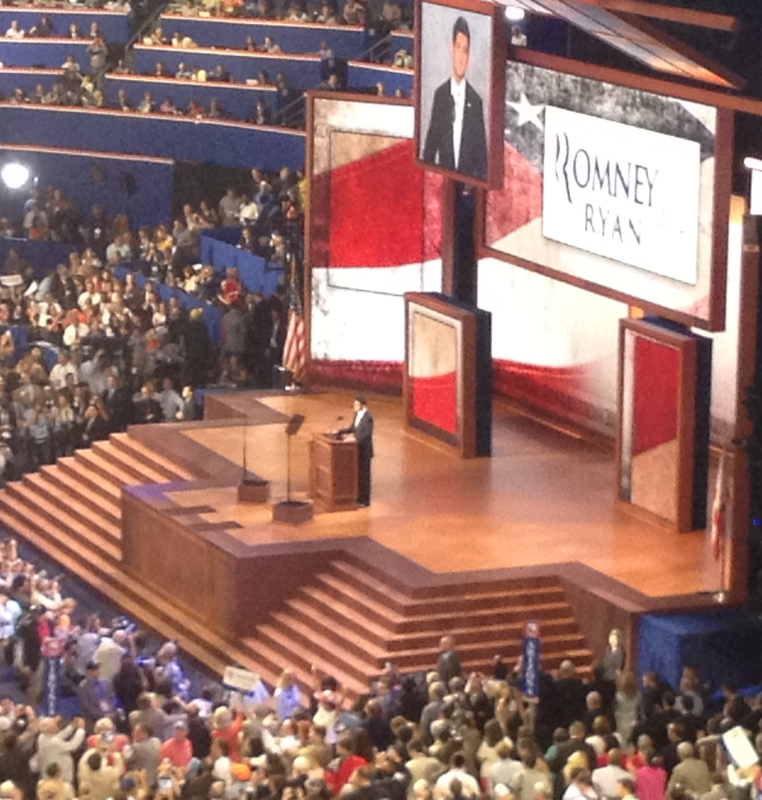 Paul Ryan speaks at the RNC. The second night of the Republican National Convention was yesterday and I was lucky enough to be there (as I will be tonight). It was a slow starting night, but finished strong with speeches from former Secretary of State Condoleezza Rice, New Mexico governor Susana Martinez and of course Paul Ryan. Republicans continued pounding the President for “you didn’t build that,” with nearly every speaker mentioning the line. It’s clearly playing a much more prominent role in the election than any political pundit predicted. It’s become the Romney campaign’s main message. Now, the line is incredibly deceptive, if not an out-and-out lie. In fact, the Washington Post’s fact checker Glen Kessler awarded it Four Pinocchios just yesterday morning. But it’s not going away, not matter how much liberal bloggers scream and yell about it. And even worse for those annoyed bloggers, it has finally given the Romney campaign something to run on. A theme I’ve noticed over the course of this election is that the Obama campaign has had a clear plan of attack against Romney, but the Romney campaign has not had one against Obama. Obama began with Bain Capital, attempting to refute Romney’s claim that his business background makes him the optimal choice for the Oval Office. The campaign (somewhat dishonestly) called Romney an outsourcer and then transitioned to sharp attacks against the former Governor for not releasing more of his taxes. Finally, the campaign turned to the Ryan Budget, trying to paint Romney as a man whose main goal is to help the rich and cut the safety net. The story flows from one theme to the other, building up evidence along the way. What did the Romney campaign have? A few gaffes that no one really cared about and an economy that, while still bad, has been slowly improving. More than anything, it needed a message. It needed something that both confirmed conservative fears that Obama is a big government socialist and convinced independents that Obama’s ultimate goal is wealth equality. In “you didn’t build that,” Romney found his message. The Romney campaign wants to convince voters that Obama is a socialist intent on using the government to control outcomes; that Obama believes government is the root of all success, that individuals are cogs in the government machine and do not determine their own success (or lack thereof). Yes, Obama does not believe any of these things. But that doesn’t matter. What matters is what voters believe. If Romney can convince voters of this message, he can win. For a while now, I haven’t actually thought the election would be particularly close but I’m becoming less convinced. Before the Romney campaign discovered this message, I just didn’t see a way for it to win (outside a European meltdown, major government scandal, etc.). But now I do. If the Obama campaign cannot refute the “you didn’t build that” message, it opens the doors for a Romney victory.